The principal message of the 'Human Choice and Computers' (HCC) tradition and its associated conferences over the years is that there are choices and alternatives. 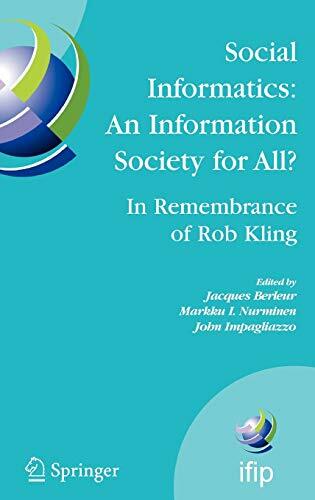 In this volume, Social Informatics takes two directions. The first supports readers in interpreting of the meaning of Social Informatics. The second, more extensive part develops an overview of various applications of Social Informatics. Researchers inspired by Social Informatics touch many areas of human and social life. Through the years, the principal message of the 'Human Choice and Computers' (HCC) tradition and its associated conferences has been: there are choices and alternatives. The special theme of HCC7 is Social Informatics, which includes in itself a promise of a less technically biased approach to informatics, whilst An Information Society for All adds the ethical aspects to it. When developing the infrastructure and applications in an information society, we should strive to afford people equal opportunities to information technologies. Professor Rob Kling introduced the name Social informatics in its widely known Computers and Controversy. He was director of the Center for Social Informatics at Indiana University, Bloomington. Unfortunately, he passed away in 2003 at age 58, leaving a rich heritage in the field. This HCC7 conference honours his work and memory, and it develops further the cultivation of Kling's legacy. Ethics, culture, politics, and law are a few areas within the realm of Social Informatics. The conceptualisations of information societies and ICT policies expand the domain towards economic, organizational, and technical issues. Additionally, this volume further develops the successful applications that require valid concepts and methods. These aspects demonstrate the power of Rob Kling's legacy. Scientific knowledge is the most durable form of that heritage because it does not decrease when used; on the contrary, diligent applications bear multiple fruits to continue that legacy.